As Vasastan in Stockholm is still a bit in denial about having become a very booming part of town, there are a few places that actually get it quite right. 2005 (pronounce in Swedish ‘sjugy-hundra-fem’) is one of the tiniest, most characteristic bars in my hood, and is a great place for a quality cocktail, a snack and a beer – all for an affordable price. On top of this, there is an upper floor ‘chill area’ where we have played Nintendo NES in comfy chairs or enjoyed a card or board game, available on the spot. I love the local beers, but also some of the top-listed international IPAs or Belgian style beers. The cocktail list is personally marked. I was happily surprised by the pineapple hustle no. 6, but there are classics available as well. For snacks, there’s cheese or cold cut platters available, but also nachos and tostis, presented in street food style. The bar staff is super friendly and has great advice and knowledge about any drink preference. I often prefer a tiny, more ‘romantic’ table on the ground floor, but also organise get-togethers with friends on the upper floor. In the summer there is the option to enjoy the warm weather on the little terrace out front. 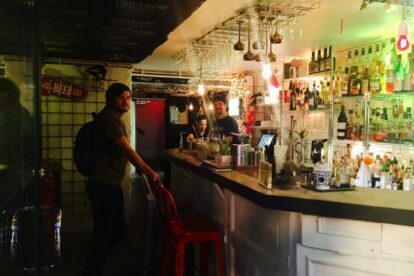 Not to focus too much on the popular and ‘hipster’ like Södermalm to find bars like this, I definitely mark this as one of my favourite ‘close to home’ places to go for a cosy afternoon or evening.